FOXSports.com and RACEDAY on FOX Sports Radio, hosted by Rob D’Amico, have teamed up to bring you the best motorsports news/talk radio program on the planet! Celebrating its 12th year, “RACEDAY” gets you “On The Grid” every Sunday morning LIVE 6-8 a.m. ET on more than 250 FOX Sports Radio affiliates, the American Forces Network and streamed live on FOXSports.com, FOXSportsRadio.com and iHeartRadio.com. RACEDAY on FOX Sports Radio covers all the racing action including NASCAR, Formula 1, INDYCAR, NHRA, IMSA, MotoGP, Supercross and off-road! Also featured are Ardy Arani’s Insider Report, Bruce Martin’s Honda Indycar Report, News & Rumors and the RACEDAY Recap. In its second decade as “RACEDAY on FOX Sports Radio,” the program has received a serious horsepower upgrade, and will now feature more in-depth motorsports coverage and inside information — including insightful commentary from Fox Sports 1 personalities. Can’t find it on your local radio station? No problem. RACEDAY on FOX Sports Radio is streamed live on the FOX Sports and iHeartRadio Apps. A podcast of the show can also be heard on FOXSports.com, FOXSportsRadio.com, iHeartRACEDAY.com, iTunes and Sound Cloud for your listening convenience. You can interact with show by calling 877-99-ON-FOX or by visiting us on the Web at www.iHeartRACEDAY.com, on Twitter @RobDAmico and facebook.com/iHeartRACEDAY. #iHeartRACEDAY, do you? Bruce Martin and the Honda Indycar Report featured every Sunday 6-8AM ET over 250 FOX Radio Affiliates, American Forces Network and iHeartRadio App. Rob D’Amico hosts RaceDay on FSR heard every Sunday 6-8AM ET on over 250 FOX Radio Affiliates, American Forces Network and iHeartRadio App. 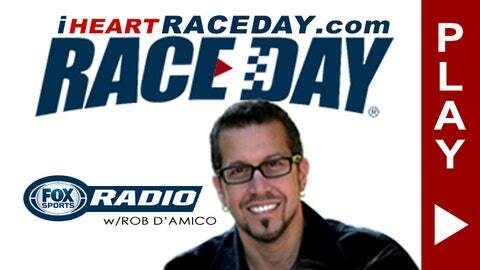 D’Amico also hosts the RaceDay Mid-Week Report every Wednesday only on FoxSports.com, iTunes and Sound Cloud.